I have been recently reading a lot about the use of virtual reality in sport, mainly because I strongly believe in the potential of using this technology in rehabilitation and training. While looking for specific articles, I found some interesting work conducted on Handball Goalkeepers by a French group. The situation between a shooter and a goalkeeper in Handball is fundamentally a duel. The shooter wants to be beat the goakeeper and score a goal, the goalkeeper wants to beat the shooter and make a save! In a duel between two players, previous research works demonstrated the role of the opponents’ motions. It means that elements in the opponent’s movements make the other player choose an appropriated reaction. The ability to utilise visual cues and “anticipate” what the shooter is doing is what makes a World class handball goalkeeper. Endless hours of shooting training help goalkeepers in developing the appropriate strategies and moves, however one could argue that the ability for a goalkeeper to progress depends a lot on the quality of players providing him/her with “cues”. Form a coaching standpoint, a goalkeeper always facing shooters “easy to read”, would never progress further, so allowing him/her to train with more advanced shooters and a variety of shooters and situations can improve the goalkeepers’ ability to develop. This is particularly true when we are thinking about progressing young goalkeepers and fostering talent. Having been in handball for many years I am still surprised about how old fashioned goalkeepers’ coaching still is. There is a lot of emphasis on technique and position (all very important), virtually no work on eye movements and visual abilities, and virtually no work on advanced cues and anticipation (due to the limitations of the quality of shooters and drills). 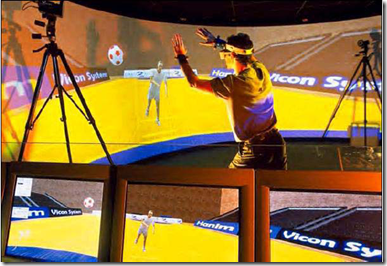 Virtual reality could be an innovative solution, and in the promising work of our French colleagues we might find a new way to progress goalkeeping to a whole new level.